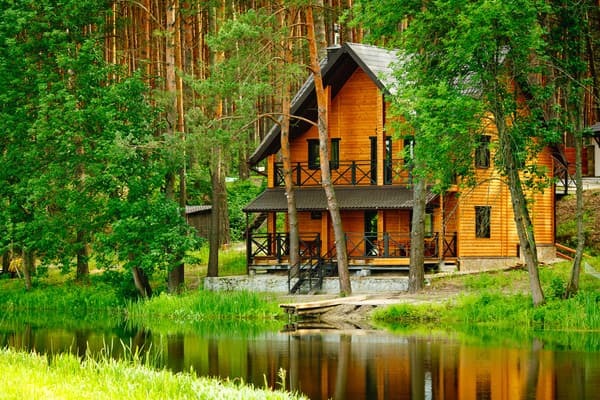 The Shishkin Inn is a country hotel on the territory of 10 hectares in a picturesque pine forest on the banks of the River Snov. The number of rooms consists of comfortable rooms overlooking the pine forest and the shore of the lake, in the decoration of which ecologically clean materials were used. 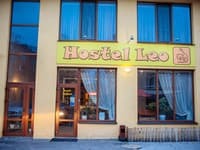 The rooms are equipped with air conditioning and heating, electronic lock, cable TV, telephone, mini-bar, electronic safe. There is a Russian sauna and billiards. For fans of active recreation, there are cycling, quad biking, hot air ballooning, fishing and the opportunity to hunt. 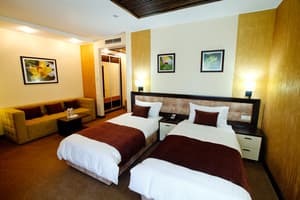 For a comfortable family holiday, there are spacious family rooms and a children's room. The complex offers 2 conference halls and 4 meeting rooms for corporate events. Guests can visit one of the theme restaurants or the grill bar on site. SPA hotel "ShishkINN" is located at a distance of 1.5 km from the bus stop Snovyanka, 20 km from the railway station Chernigov. From 01.06.18 to 15.10.18 and holidays, the prepayment is not refundable, in case of cancellation 3 days prior to arrival, the prepayment is transferred to the deposit, if less than 3 days cancellation of the reservation - a prepayment for 1 day is charged, the balance is transferred to the deposit. Description of the room: Spacious room overlooking the shore of the lake. The room area is 32 sq.m. Sleeping places are provided in two separate beds (size 1.0 mx 2.0 m). 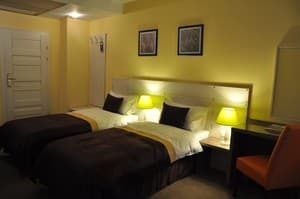 Description of the room: Cozy room with a double bed (size 2.0 mx 2.0 m). From the windows of the room you can see the panorama of the lake. Room size: 33 sq.m. Description of the room: Two-storey cottage with an area of ​​75 sq.m., has three rooms. The cottage is equipped with air conditioning and heating. Interior: 1ST FLOOR Entrance hall: wardrobe for clothes and shoes, luggage. 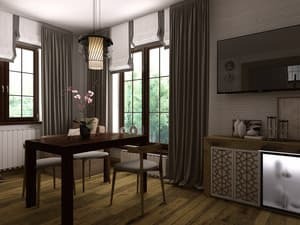 Living room: kitchen worktop with sink, microwave oven, kettle, locker hanging with utensils, dining table, chairs, floor lamp, folding sofa (1,8 * 2m), folding chair (0.8 * 2m), TV, bedside table with mini-bar. Bathroom: shower, toilet, washbasin, mirror, heated towel rail, hair dryer, accessories; is equipped with bathrobes and towels, toiletries. FIRST FLOOR Bedroom 1: 1 bed (size 2.0 mx 2.0 m), folding armchair 0,8 * 2m), bedside tables, desk-office, desk lamp, chair, wardrobe, TV, air conditioning. Bedroom 2: 2 beds (size 0.9 * 2m), bedside tables, desk-office, table lamp, chair, wardrobe, TV, air conditioning. Bathroom: shower, toilet, washbasin, mirror, heated towel rail, hair dryer, accessories; is equipped with bathrobes and towels, toiletries View from the window: panorama of a pine forest. Children under 6 years without a separate bed are accommodated free of charge. It is possible to provide an extra bed. The service is chargeable, requires agreement upon booking. The cost of additional space until 31.03.17 -420 UAH. per person, from 01.01.17 to 31.05.17 - 550 UAH. per person. Guests can visit one of the theme restaurants or the grill bar on site. Breakfast is included in the room rate, and an additional breakfast (190 UAH) is also available. 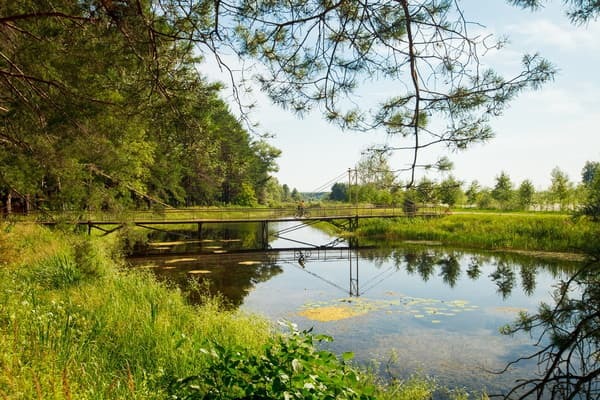 The Shishkin Inn is a country hotel on the territory of 10 hectares in a picturesque pine forest on the banks of the River Snov. The distance to the Chernigov railway station is 20 km, from the bus stop Snovyanka - 1.5 km. Move in the direction of exit from Kiev (Brovarsky Ave) all the time right along the E95 to Chernigov. 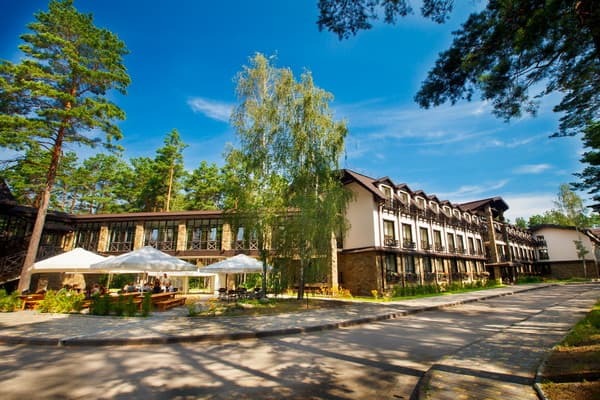 Upon arrival in Chernigov follow the road signs "Country Spa Hotel ShishkiNN". After the checkpoint, continue straight for about 14 km to the village of Snovyanka. At the entrance to the village on the second pedestrian crossing turn left and follow the signs for another 1.5 km to the barrier of the eco-hotel ShishkiNN.